Although a cause for dyslexia is not yet known, recent advances in neuroimaging help us understand many of the neurological underpinnings of dyslexia. We reviewed the work of prominent researchers in this area. This summary explores recent research into the brain-based differences between individuals with and without dyslexia. Learning to read does not come naturally to everyone, as dyslexia affects 5-12% of English speakers (Rutter et. al., 2004). The International Dyslexia Association defines dyslexia as “a specific learning disability that is neurobiological in origin. It is characterized by difficulties with accurate and/or fluent word recognition and by poor spelling and decoding abilities.” Individuals can have impairments in either or both phonological awareness and rapid automatized naming (RAN); those who have a so-called “double deficit”--difficulties in both of these areas--are purported to experience more severe challenges with reading. Deficits in mental orthographic imaging (i.e., visual memory for words) can also occur, impacting a reader’s ability to efficiently recognize word parts and patterns, despite numerous exposures and practice. Left occipito-temporal cortex (OTC), also known as the Visual Word Form Area, responsible for visual recognition of letters and words. Left Temporo-parietal cortex (TPC), is responsible for storing and retrieving sounds (phonemes), and integrates phoneme/sound to grapheme/letter correspondence. Left inferior-frontal gyrus (IFG), involved in retrieving and articulating sounds (phonemes). Readers with dyslexia are often characterized by brain anomalies in the occipito-temporal cortex (OTC) and the temporo-parietal cortex (TPC). The OTC is frequently referred to as the brain’s letterbox, that is, the region in which neurons are specialized for recognizing strings of letters as known words. Imaging studies of the brains of readers with dyslexia, compared to typical readers, reveal the lack of a strong signal usually seen in readers when they simultaneously recognize all the letters that compose a word (Dehaene, 2010). The TPC, on the other hand, is responsible for quickly accessing the mental sound-representation, or phonology, of a written word. Dyslexic readers tend to activate the TPC in the righthemisphere, rather than the same area in the left hemisphere used by typical readers (Dehaene, 2010). However, it is important to remember that various regions in the brain work together and share information during the reading process. For example, phonological awareness and RAN do not rely on the exact same neural correlates, but there is overlap in their representation. According to the research we examined, the brains of readers with dyslexia are distinct in several ways from those of typically-developing readers. The brains of individuals with dyslexia are marked by relative disorganization across a variety of cortical regions, patterns of insufficient or different activation when engaged in reading-related tasks, and disruptions in connectivity between regions in the brain involved in the reading circuit. Dehaene attributes cortical disorganization to disruptions in the process of neuronal migration during prenatal development, leading to ectopias, or clusters of misplaced neurons, which have been observed in autopsy studies. It is interesting to note that readers with dyslexia had both moregray matter (bodies of neurons) in some areas, but also less gray matter in other regions, in comparison to typical readers. Importantly, PET scan studies conducted by Eraldo Paulesu and his colleagues with groups of dyslexics from three different language backgrounds (English, Italian, French) demonstrated that areas in the left temporal lobe were insufficiently activated in the brains of dyslexic adults as compared to their control groups (Paulesu et. al. 2000). In the same set of patients, Paulesu’s group found increasesin gray matter density corresponding to the areas where activation of the brain was more limited. Though one might wonder if this finding was due to the adults’ lifetime of reading deficits (and thus may not be present in younger dyslexics), reduced activity can also be seen in this same area in children between eight and twelve years of age (Dehaene, 2010). In addition, the dyslexic population is often characterized by differences in activation of the left inferior frontal gyrus (IFG), which includes Broca’s area, an area that is crucial for planning and producing speech. In this region, the brain becomes overlyactive in people with dyslexia when they try to complete phonological tasks, action that Dehaene describes as a “compensatory strategy.” That is, dyslexics attempt to use this region designed for speech production to help with reading, instead of bringing on board better-suited posterior regions used by typically-developing readers. Sally Shaywitz’s team at Yale University and Pugh et al. (2013) have encountered similar results, in that individuals with dyslexia tend to activate more frontal regions, rather than posterior brain regions (specifically the TPC and OTC mentioned above). Pugh et al. (2013) also noted that some (not all) dyslexic readers also showed increased activation in righthemisphere posterior regions and bilateral frontal regions, in comparison to typical readers. Finally, disruptions in connectivity between portions of the reading circuit seem to be at play in the representation of dyslexia within the brain. Pugh et al. 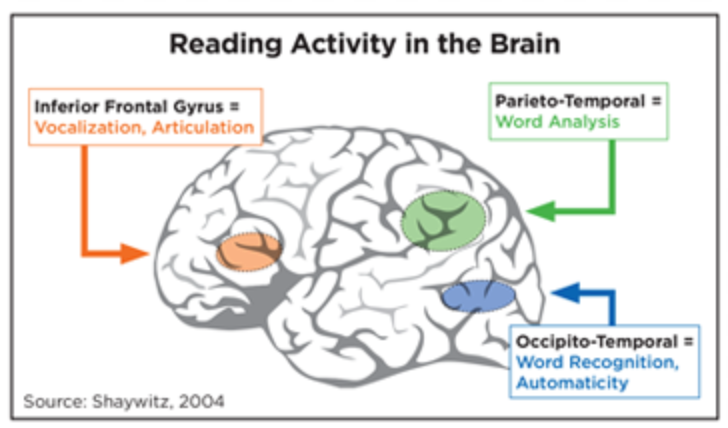 (2013) characterize the reading brain as a distributed, multimodal learning circuit, in which a student’s attention helps to modulate and control the coordination of the various regions involved. Maryanne Wolf (2010) describes unimpaired readers as having automatic connections established between the OTC and frontal areas in the left hemisphere, while individuals with dyslexia often have the strongest connections between the left OTC and frontal regions in the righthemisphere. Dehaene’s review of the literature on brain representations of dyslexia notes that being literate results in a thickening of the corpus callosum, the fibers connecting the two hemispheres of the brain. The brain-basis of rapid automatized naming (RAN), a critical skill for fluent reading, is not well understood, but one study illustrated a widely distributed image of activation across both hemispheres (Misra, Katzir, Wolf, & Poldrack, 2004, cited in Norton et al., 2014) Other studies have implicated both the left inferior frontal gyrus (IFG) and the right cerebellar hemisphere (Norton et al., 2014) in RAN. In conclusion, the current literature on the neurological foundations of reading relies on a broad, distributed network; no single area is responsible for reading. However, the process involves such key regions as the occipito-temporal cortex, the temporo-parietal cortex, and the inferior frontal gyrus. The brains of individuals with dyslexia are marked by relative disorganization across a variety of cortical regions, patterns of insufficient or different activation when engaged in reading-related tasks, and disruptions in connectivity between regions in the brain involved in the reading circuit. Paulesu, E., McCrory, E., Fazio, F., Menoncello, L., Brunswick, N., Cappa, S. F., ... & Pesenti, S. (2000). A cultural effect on brain function. Nature Neuroscience, 3(1)91-96. Wolf, M. (2010).Proust and the squid: The story and science of the reading brain. Cambridge: Icon Books.